Make it longer and wider, yet lighter and stronger. 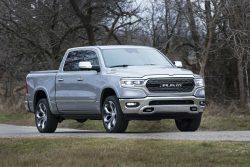 Ram Truck engineers were tasked with a tall order in creating what the ‘no-compromise’ 2019 Ram 1500 would look like, how it would handle and how well it would fulfill a promise of best-in-class durability. For the Materials engineering team, it was a challenge that meant rethinking the design and build of a key component of the truck, the frame. Team leader Larry Sak and his group got to work on an approach that not only pushed the boundaries of conventional thinking, but resulted in the strongest Ram 1500 ever with the most efficient frame in the segment. In this edition of Truck Thursday, Sak recounts how his team managed to accomplish this challenge while also trimming 100 pounds from the frame itself, and 225 pounds overall off the 2019 model over the previous Ram 1500.